Are you passionate about helping people with their money so they can improve their lives? If so, you’re in the right place. AFCPE® counseling and coaching certifications are the most respected in the field of financial counseling and education. The AFC® is the gold standard on which all our certification programs are based. Each is structured, rigorous and highly focused on professional development and continuing education. Select the certification program that best fits your professional requirements and meets your career goals. AFCPE® offers three certification programs with varying education paths. Choose a course below to begin impacting lasting financial well-being for all people. The gold standard: Comprehensive life-cycle financial education, providing the knowledge and skills to assist clients in complex financial decision-making. Provides you with the skills and techniques to build upon your financial foundation and support clients as they make lasting financial behavior change. The AFCC® program is provided by the Ontario Association of Credit Counseling Services (OACCS). Not quite ready to dive into certification? Not a problem. Just like you, we meet our people where they are. Check out our selection of training courses. The NCCA has granted accreditation to the AFCPE’s Accredited Financial Counselor® (AFC®) program for demonstrating compliance with the NCCA Standards for the Accreditation of Certification Programs. The National Commission for Certifying Agencies (NCCA) has granted accreditation to the AFCPE®’s Accredited Financial Counselor® program for demonstrating compliance with the NCCA Standards for the Accreditation of Certification Programs. Accreditation is for a five-year period, expiring December 31, 2020. The NCCA is the accrediting body of the Institute for Credentialing Excellence. 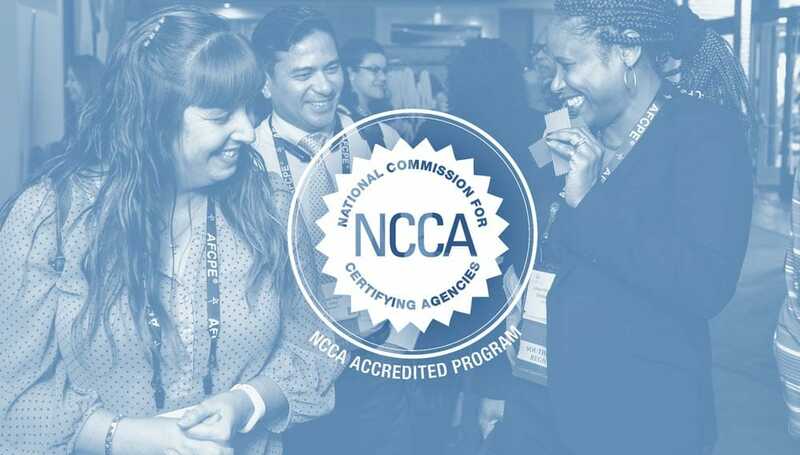 The NCCA Standards were created in 1977 and updated in 2003 to ensure that certification programs adhere to modern standards of practice for the certification industry. AFCPE® joins an elite group of more than 120 organizations, representing over 270 programs, that have received and maintained NCCA accreditation. "The AFC® is a credential that will enhance just about any career that involves service to others. Whether a student becomes an advisor, counselor, teacher, therapist, pastor, or non-profit worker, knowing how to skillfully address financial issues gets to the root of a basic human need that also is highly connected to their hearts." "If there’s one designation you’re going to start with, start with the AFC®. I’m not just saying that, I got my CFP® first and if you want to work with folks who need this information and help the most, the AFC® covers the knowledge base and the behavioral/psychological training you’ll need to help people truly make change." Professional development is a career-long process. Over the course of a career, many changes will occur in a field of expertise that require an updating of knowledge and skills. These changes can include the introduction of new product and service offerings in the financial marketplace, as well as changes in laws and technical knowledge related to personal finance and counseling. In compliance with NCCA Accreditation, AFCPE® publishes exam statistics on an annual basis. Explore courses that help you build a strong financial foundation or act as a stepping stone to certification. Taking you through the essential steps of money management to provide you with a firm financial foundation - for you and those you serve. Upon completion of this engaging and interactive live training you’ll be able to take the core essentials of financial coaching and begin to put them into practice. Teaching you the essentials of assisting clients with disabilities and their families as they move towards financial inclusion and well-being. This professional development training builds upon Coaching Essentials, taking a deeper look at each skill and technique while providing guidance as you develop your coaching skills. Coaching Mastery takes your training to the next level through exam, experience, ethics and a commitment to ongoing professional development to continually enhance your coach skills and knowledge.